Valentine’s Day is almost upon us, and It is time to experience something unique with your loved one. As we’re celebrating the month of love, we are rolling out the red carpet for you and your significant other with our extensive Valentine’s Day offerings, including memorable getaways, fantastic evening out, amazing culinary and romantic dining experiences that you absolutely cannot miss! 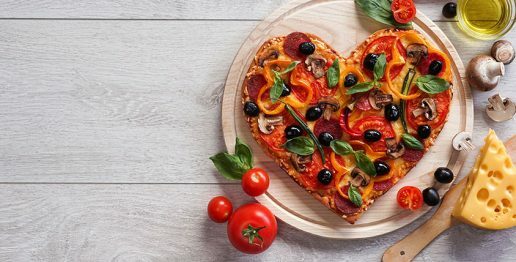 Whether you fancy muttering sweet nothings in an exquisite hotel room, spending some quality time with your Valentine’s Day date, or long for a romantic dinner in truly ambient style, we have some unique Valentine’s Day ideas that will inspire you. Ossiano, one of the top ten places in the world to propose and four-time winner of Best Seafood Restaurant in Dubai by Time Out Dubai, for a dining experience unlike any other. Treat your palate to a seven-course set menu, crafted by Grégoire Berger’s crafted specially for the occasion. Choose from four different dining packages – Platinum (cue: the best of all dining experiences that also gives a complimentary Tiffany & Co. bracelet for her), Gold (cue: this package is perfect for you if you would like to deliver an under-the-water personalised message for your loved one), Silver and Blue – each one offering a decadent dining experience with breath-taking views of the colourful aquatic life of the Ambassador Lagoon. Tip: You and your loved one will receive a complimentary bottle of Perrier-Jouët Grand Brut Champagne on your next dinner reservation. Be greeted by a live pianist with the sweet sound of the piano as your delightful evening begins. Celebrate love at the world-renowned Japanese restaurant that blends cutting edge style with South American influences creating a truly memorable dining experience set against a backdrop of exquisite architectural design. 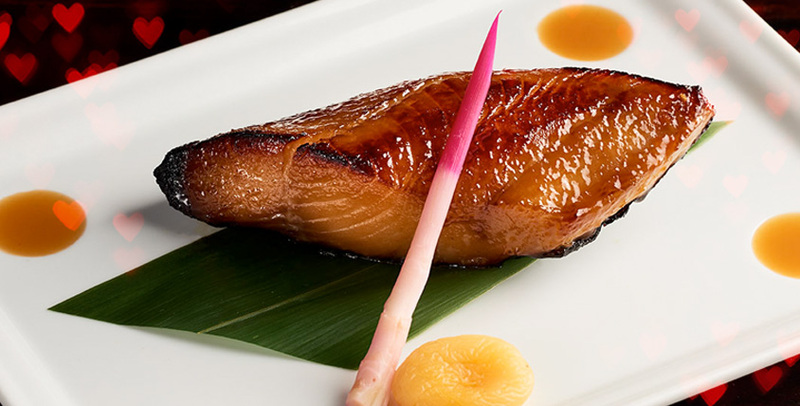 Let your taste buds indulge on a special Omakase six-course set menu featuring highlights such as the black cod yuzu miso, a selection of sushi and rolls and the ribeye tozasu butter. 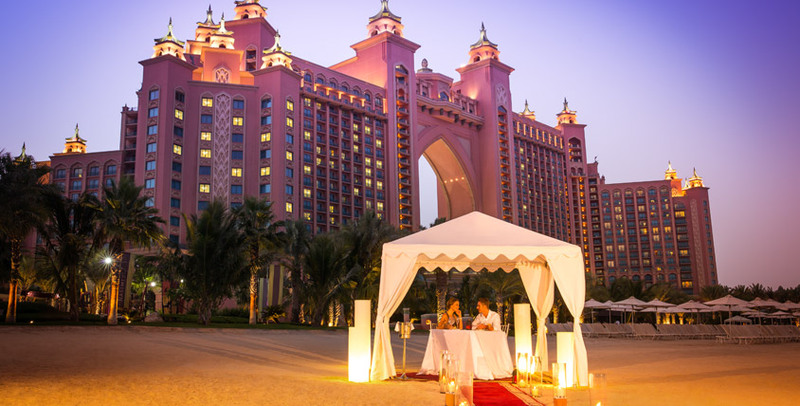 Nothing beats al fresco dining under the stars than the magical atmosphere of Atlantis, The Palm’s Royal Beach. Treat your significant other to a once in a lifetime evening in an elegant candle lit cabana with a sumptuous six-course dinner, which complements pretty sunsets and uninterrupted views of the iconic Palm Island; making you wish that time would just stop. Pop a complementary bottle of premium bubbles, and savour dishes including Boston lobster with king crab, Atlantis beef tenderloin or black cod and a white chocolate fondue for dessert as the perfect end to an evening of romantic indulgence. Tip: You will be accompanied by a violinist, with live violin music playing harmoniously in the background, as you snuggle up to your beloved to watch the sun set over the mesmerising blue of The Palm Island, before settling in for a fabulous meal. 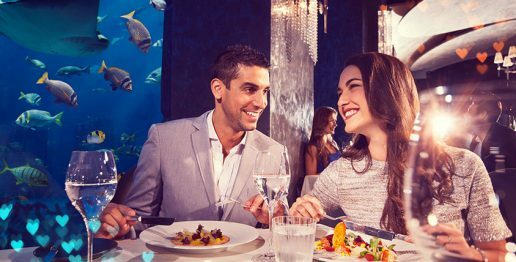 AED 4,200 per couple for a six-course set menu including a bottle of Perrier-Jouët, Grand Brut and welcome bubble as well as unlimited soft drinks. Email or call +971 4 426 1166 to reserve a special outdoor dining experience at Royal Beach. 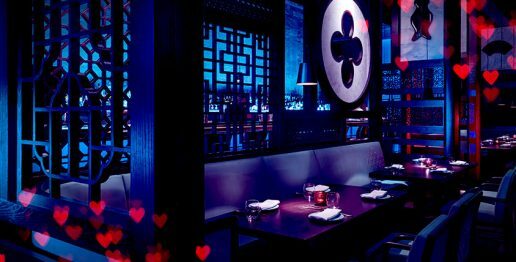 Make a lasting impression with a culinary experience in a class of its own at the award-winning Cantonese restaurant, Hakkasan Dubai. 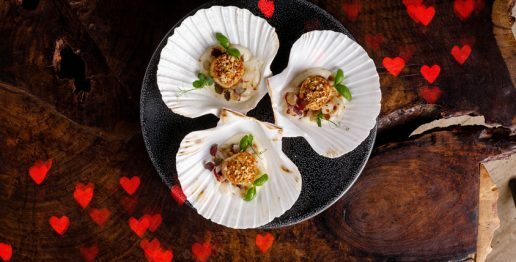 The three-course signature set menu begins with a valentine dim sum duo and will end with a delectable Peach Melba Brûlée in a cozy and private atmosphere. Complemented with a special surprise for the ladies will surely be a night to remember. Reserve a table to savour the signature three-course set menu for AED 398 per person. 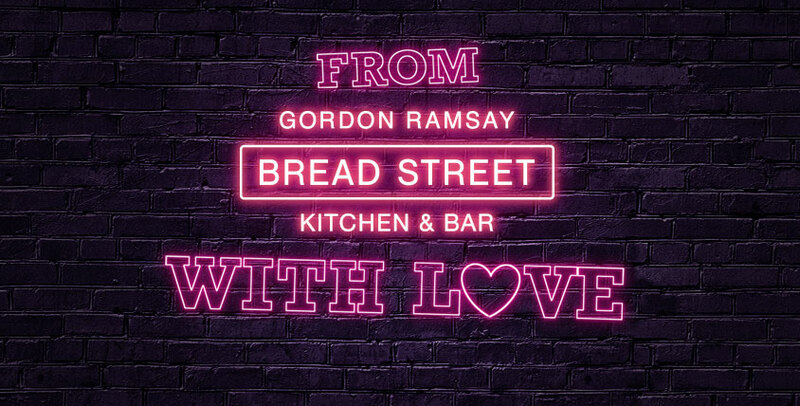 Dining out doesn’t get much more romantic that it does at Bread Street Kitchen. “From BSK with love” offers you a delicious five-course menu that features delectable dishes including Kelly oysters to start, followed by lobster ravioli and fillet mignon, ending with the seven shades of chocolate dessert. Tip: As a special surprise, every couple celebrating their love at Bread Street Kitchen will receive a rose and a selection of chocolates in a customised box. 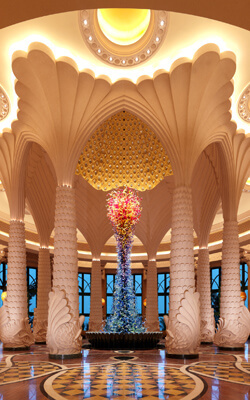 Reserve the Valentine’s Day five-course dining experience is AED 295 per person. 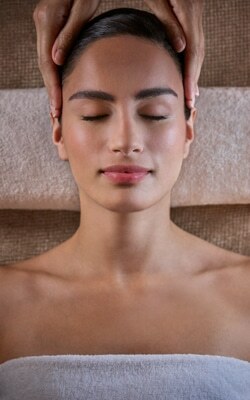 Craving an aphrodisiac treat? Head to Ronda Locatelli for a taste of refined Italian cuisine in a warm, charming setting. Indulge yourself in the Italian San Valentine dinner – a special two or three-course menu specially crafted in partnership with Michelin starred chef, Giorgio Locatelli – filled with delicious dishes including a small tasting fish or meat option to start, followed by ravioli pumpkin pasta or pan- fried seabream and red Sicilian prawn carpaccio. End this fantastic meal with a white chocolate sphere passion fruit sorbet. Book a two-course set menu for AED 190 per person and for a three-course set menu for AED 240 per person. Considered the epitome of fine dining for meat lovers in the Middle East, Seafire Steakhouse takes you away on a journey you won’t easily forget. 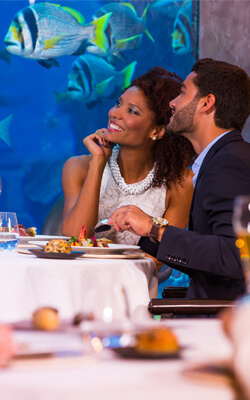 Take a seat and prepare for the arrival of ‘meaty’ dishes with a three-course dinner including oysters and cappuccino soup to start, followed by seared scallops and surf and turf, with the Atlantis beef tenderloin. What’s for dessert? None other than red velvet cheesecake. Tip: You and your loved one get to enjoy specially crafted ‘Romeo and Juliet’ cocktails and live music by a popular Jazz duo. Reserve a table for a six-course set menu AED 350 per person and Valentine’s Day cocktails for AED 80. 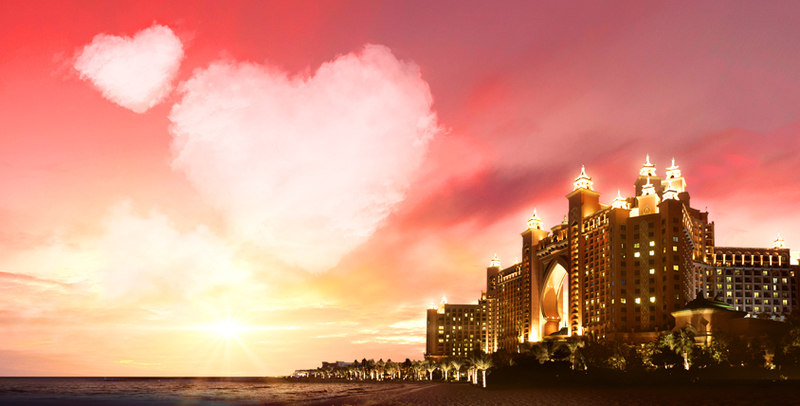 However you wish to spend your Valentine’s Day, Atlantis, The Palm will inspire your heart strings with beautiful rooms and suites, delicious dinners, relaxing spa treatments and exceptional marine & waterpark experiences.